There are several spots open in our camp on the Rankin County/Simpson County line about 8 miles south of Florence. This is a very family friendly environment where kids and spouses are welcome and encourage. We do allow adult beverages but you won't find a better core group of guys. Camp membership usually is between 40 to 50 members, and we still can't get enough folks in the woods to take the recommened DMAP does. Dues are $1500 the first year and $1250 after that. We have Deer, Excellent Turkey Hunting, Dove hunting and a great Crawfish boil. We have been on the DMAP Program for about 5 years now and it is really starting to pay off. 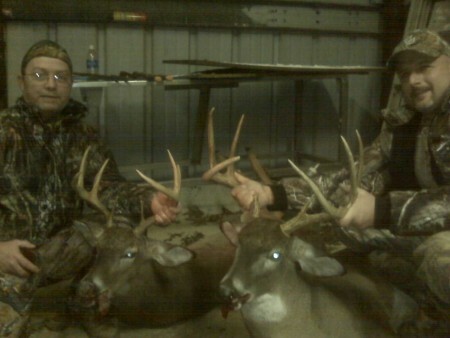 Below are some pics of the deer from the last year. Contact me via this site or Rodney Simms at 601-559-9010.